“In the hands of an outstanding artist like Taylor, the instrument seems almost heaven-sent,” wrote John Lambert in the Spectator of George Taylor, violist. Taylor is active in practically every aspect of performance as soloist, recitalist and chamber musician, and his playing has been praised for its eloquence, warmth and sensitivity. Mr. Taylor is currently Professor of Viola at the Eastman School of Music. Before joining the Eastman faculty, he was a member of the Ciompi Quartet of Duke University, a position he held from 1979 through 1986. A dedicated, sought-after and beloved teacher, he has served on the artist faculties of The Castleman Quartet Program, Le Dormaine Forget, the Chautauqua Institution, Musicorda, The Encore School for Strings, the Meadowmount School, the Manchester Music Festival, and the Elan International Music Festival, among others. 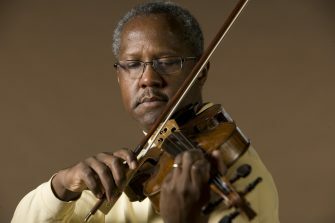 Mr. Taylor is also the inspiration for and collaborator in a series of highly successful workshops called “Viola Intensive’ and presents a summer technique workshop for violists at Eastman. With faculty colleagues Carol Roland and Phillip Ying he co-hosted the highly successful 40th International Viola Congress at the Eastman School of Music. He has also served as a juror for international competitions in Europe and the United States, and has served on the boards of the American Viola Society and the Sphinx Organization. Mr. Taylor can also be heard in a landmark recording of the complete chamber music of the African/American composer William Grant Still by the Videmus Ensemble. He has also recorded music by composers such as Frederick Jacobi, John Zorn, Ernst Toch, Jan Radzynski, Ezra Laderman among others for the Milken Foundation. He was co-founder and conductor of the St. Stephens Chamber Orchestra (Durham, NC), an ensemble that has continued to perform and record together to date as the Orchestra of The Triangle. An active advocate for the performance of music by African/American composers, Taylor was a participant in the National Black Arts Festival held in Atlanta, GA and the Gateways Music Festival. He was also a member of the Black Music Repertory Ensemble, which presents music of African/American composers in concerts throughout the country, and is currently a member of The Ritz Chamber Players. Mr. Taylor has performed and premiered works written for him by many composers, including Bill Dobbins, Michael Kimber, Ron Carter, Noel DaCosta, George Walker, David Liptak and Carmen Moore. For more information on George Taylor, please visit his website at www.georgetaylorviola.com.